There are lots of rules - but for good reason - to keep you alive! 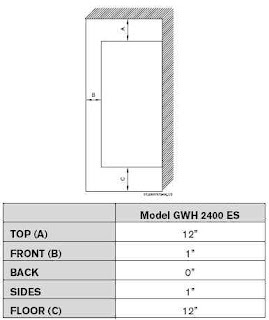 Install Heater with Lots of Elbow Room. You can place the heater in a closet but remember you need to keep it free from anything within 2 feet of the front and 1 foot on each side plus clear air above it. Not only to you not want anything flammable leaning against it you need room to service it. You should place the unit at eye level so that it is easy to service. Use Category III Stainless Vent Pipe: Treat the exhaust pipe like any other chimney - after all it is a chimney with lots of hot exhaust gases going up it. In my opinion Z-Flex makes the best and easiest to use Cat III SS Vent Pipe. Follow All the Rules for Black Gas Pipe installation: Key rules include: a shut off valve at each appliance, sediment trap (drip leg), do not under-size the pipe (use 3/4 inch pipe); be sure to test for leaks! 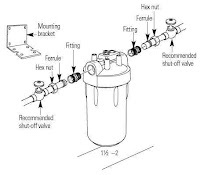 ; and use flex pipe to connect appliances to the black pipe (this isolates movement, hence, potential leaks). 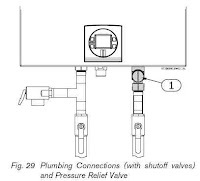 Follow the Instructions for Connecting to the Water system: The critical things are a relief value on the hot water side of the heater and water shutoff on both sides of the heater - one for hot one for cold. Also if you are using the newer plastic pipe for your water system, you should not connect it directly to the heater - most suggest a buffer of 2-3 feet of copper pipe. You also need a drain near by where the relief valve can drain and where you can drain the water to when winterizing the cottage. Use Clean Water: This is especially important for the Cottage. Be sure to install all your water purification systems in the line before the heater.